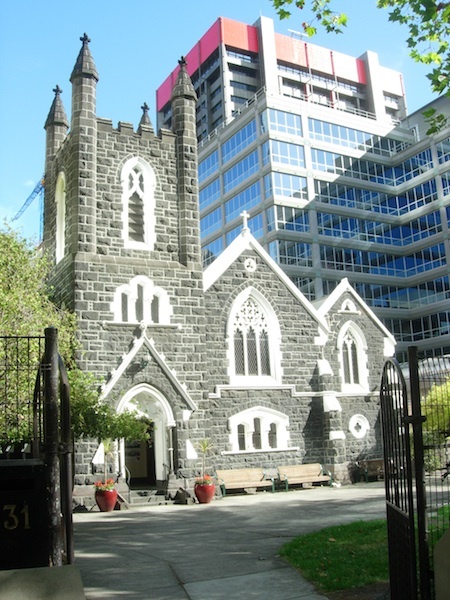 St Augustine’s Catholic church is in Melbourne’s CBD. It was designed by T.A. Kelly and built by Reid and Stewart. The bluestone church was completed in 1870, with an extension to the tower made in 1936 and the sacristy was added in 1965. The church was built in the Gothic Revival style and features prominent pointed arches highlighted by white stucco, window tracery, buttresses, and a square tower topped by a crenelated parapet and corner pointed finials. St Augustine’s is named after one of two early medieval saints. St Augustine of Hippo (354-430) was a bishop in Algeria and is considered a Father of the Church due to the influence of his theological teachings. St Augustine of Canterbury (?-604) was amissionary sent by Pope Gregory the Great in 595 to the convert the Anglo-Saxon king Æthelberht of Kent. Augustine was successful and became the first Archbishop in Anglo-Saxon England, establishing himself in Canterbury. 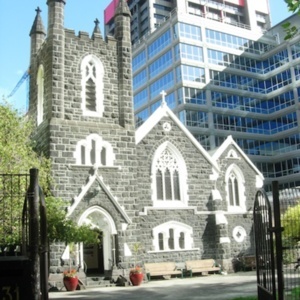 “St Augustine’s Church, Melbourne, Victoria,” Medievalism in Australian Cultural Memory, accessed April 23, 2019, http://ausmed.arts.uwa.edu.au/items/show/1307.